Put a little fun in your business holiday greeting this year with a photo of your team. Design: Large photo with message block and logo. 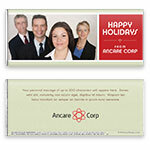 Personalization: Photo, front message, back message and logo. Recommended Photo Size: 1060 W x 525 H pixels.